Back in the days when I was growing-up, if something broke or even just wore out, you could fix it. If your shoes needed new heels or new soles, you could take them to a shoe repair shop and a skilled craftsman would do what was necessary, and give them back to you fully serviceable and looking "good as new". When your car broke down or went out of adjustment, a mechanic could fix it, and "fix" often actually meant fix instead of just replacing worn or damaged parts, as it does today. A large part of that was because cars were simpler then, with just a mechanical distributor, a single ignition coil, and ordinary spark plugs that required, like the "points" in the distributor, regular replacement. They had carburetors, too, that were both easy to adjust, and required regular cleaning and adjustment. The fuel injection systems that are now standard for all modern cars were rare and costly accessories back then, and the now-ubiquitous computers that control almost all of a modern car's functions were utterly unheard of – even for the government and the military. The result was cars that, unlike those of today, could be fixed, and not just fixed, but actually modified or diddled with by ordinary people, and every kid of sixteen years (driving age) or older either had or dreamed of his own hotrod or custom car. Your television set was the same sort of thing (except, of course, for the "mods"). If something actually went wrong with it, it could be fixed, too. 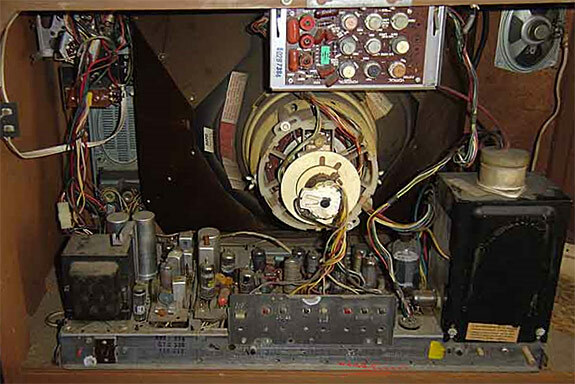 You could take it to (or more likely call) a TV repair man who had the tools and knowledge to trace its circuits and to make whatever repairs were necessary. The fact, though, was that most of what a TV service man would do when he came out was just to check and replace tubes. Virtually anything else, except perhaps a blown internal fuse or a failed solder joint, would require that the set be "taken back to the shop" (the most dreaded of phrases), and that was likely to be hugely expensive. Fortunately, the most likely problem to befall the sets of those days was a "bad" tube, and we very quickly learned that all you had to do to save yourself a service call and a worthwhile amount of money was to take out all of the vacuum tubes, carefully marking where each one went, so you test them and put them back in again. You would take them to your local drugstore, or even many supermarkets had tube testers, where they had a do-it-yourself tube tester and you could see what you needed and buy it right there. If you bought your tubes from the drugstore you would, of course, pay full retail. This would save the cost of a service call. If, instead of that, you took your tubes to a place like (for me) Valley Electronics Supply, in Reseda, California (more like a modern auto parts store than a modern Radio Shack), you could still test them free. But if you needed any, you could buy them for "audiophile net", while this cost was higher than true wholesale, it was still as much as 40% below the price they would charge you at the drugstore. Valley Electronics Supply had, in addition to just tube testers and all kinds of interesting and exotic parts and goodies, a fully stocked for its day genuinely state-of-the-art Hi-Fi department. When I first started going there, I had no idea at all of what they were. 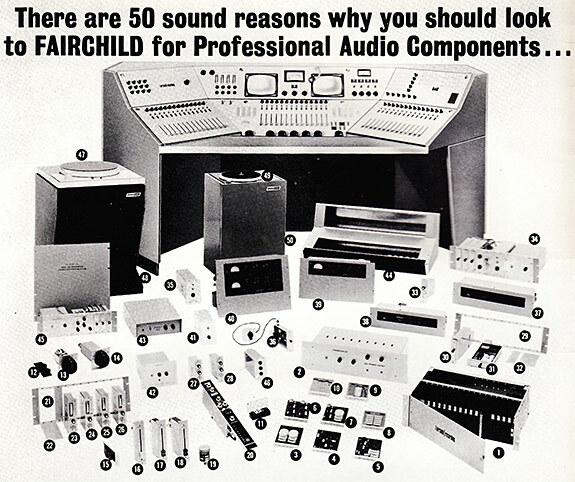 The Hi-Fi department carried McIntosh, Quad, Harman-Kardon, Electro-Voice, James B. Lansing, Klipsch, University, Fairchild, Garrard, Rek-O-Kut, Pickering, Berlant-Concertone, and practically every other major brand. Just as budding hot-rodders hung out at garages and auto parts stores to learn and practice their hobby, Valley electronics was where I and other budding Hi-Fi Crazies hung-out and picked-up much of the Hi-Fi and electronics knowledge that we needed to feed and support our own hobby. It was at Valley Electronics that, after I had first been exposed to and drawn into the thrall of Hi-Fi, I bought (because "ready-made" cables didn't exist at the time) the materials – nickel-a-foot Belden microphone cable and two-for-a-nickel cardboard-centered "tulip-style" RCA connectors -- to make my very first cables. 1.) All of the things that I messed-with were able to be modified or repaired. 2.) All of the things that I messed-with were simple or accessible enough that I could mess with them. 3.) Parts and "How-To" information were readily available from sources that a kid could access and at prices that a kid could afford (even though it might take some saving, haggling, or improvising) . 4.) The culture of the time had a do-it-yourself orientation that encouraged me and my friends and contemporaries toward experimentation and self-reliance. 5.) There was no governmental or institutional law or regulation to prevent us from doing it. So how does that differ from today? Think about it: Practically nothing on your car is manually adjustable; computers do everything, and they will soon be doing more. When was the last time you saw a shoe repair shop? When your shoes wear out you now just throw them away. Same thing with TVs and many other appliances: When my 50" TV died I found that getting it repaired would either be impossible or so expensive that it would be cheaper to buy a new set and throw that one away (which I did). And that, in itself, could have created a problem. Today, in order to (or at least as claimed to) protect the environment, not only does practically nothing seem to be repairable or adjustable, in many cases you can't even throw it away without a permit. And an advance "disposal fee" for certain products is becoming increasingly common. Now, think about this, too: It's not just boy Hi-Fi Crazies or Hot-Rod and Custom Car Nuts that this new technology and legislative environment is having its effect on: Edison, Alexander Graham Bell, Henry Ford, (and even earlier automotive types, like Charles Duryea and Gottfried Daimler – both of whom have been credited with inventing the automobile) were all tinkerers. They were followers of the time-honored, but increasingly less possible art, of diddling with stuff until it turns into something. Not one of the great discoveries of our time has been made, at base, by a highly trained government-or-industry-funded research team. It seems to always have been made by fanatics, independent researchers, dreamers and tinkerers who open the door and first step through it. 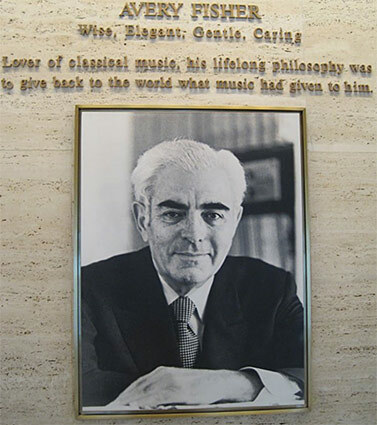 I was initially going to point out how Hi-Fi Crazies – including an amateur violinist and lifelong music lover like Avery Fisher, and not some lock-step technological elite – had helped our industry to grow. This is also how Hot Rod fans, by creating a whole accessories and bolt-on goodies industry, helped to build an automotive aftermarket. Yet the fact of it is that it wasn't just the offshoots – the toys, and goodies – that owe their existence to inspired, individual experimenters. It was the basic industries themselves. Removing the ability to fix things removes the ability to diddle with them and to be inspired by what you learn from that to create something even better. It may also remove both the possibility and the inspiration for (just in the audio industry) the formation of all of those great and honored companies that bear not just some corporate logo, but the name of an honored founder. It brought uspeople like Herman Hosmer Scott, Rudy Bozak, David Hafler, Sidney Harman, and so many more. To quote my pal Al Morimoto, "The high-end wasn't created by GE, RCA, Sony, Panasonic, Kenwood, or other major corporations. In large part, it was the product of fanatical hobbyists and tinkerers who put together parts from electronic supply houses, and didn't just measure signals on their meters and other fancy devices as did the E.E.s from MIT, Cal Tech, etc.. They actually listened to their systems. Certainly Hi-Fi is technical, but it's also art in the sense that perception of sound is always a subjective experience." If we continue on this present course, with everything in our society becoming ever more disposable and ever more the product of a team instead of some inspired teenager who used to hang-out at Hi-Fi shops, where will our new innovations come from? Where will we get the new toys and technologies to improve and enrich our lives? Where will we find new ways to enjoy the music?